You're looking at a list of three of the most common phrases that have been written in this forum (and in our inbox from visitors who are just about to start their training with EMPOWERgmat Course). If any of these concerns sounds familiar to you, then there is some good news - they CAN be properly addressed. The solution involves clear steps that can be accomplished with focus, discipline, and the right training. Interest in the topic of the passage, and in the author's agenda, will help make a significant improvement in how you handle the majority of RC questions. GMAT Test Takers receive four passages on test day, and most Test Takers find at least 3 of the passages to be boring, complex, and/or intimidating. These are all symptoms of a ‘bad choice’ on the Test Taker’s part. For some reason, if a topic doesn't immediately grab a Test Taker, a ‘block’ occurs, and the content becomes painful, anxiety-inducing drudgery. • Your likelihood of getting better financial awards, scholarships, etc. That overall potential reward is an opportunity of a lifetime. Reading comp isn't something to fear or loathe, it's something to savor and relish. It's one of the greatest deals that life affords us! Be 100% engaged for this brief window of time, and they GMAT will open up an untold opportunity for you. RC is a precious gift, if you make it one. To properly understand the ‘scope’ of developing the proper RC skills, we have to take a good look at the other (harsh) end of the spectrum: what happens if you hear someone say that they CAN’T be curious about a random array of topics for a few minutes…? Maybe Business School just isn't right for THAT person. Business School programs will pummel students with a staggering array of Case Studies, lessons and readings right from the outset. Students will be called upon to proffer an opinion in front of classmates. Students will also be assigned to a group of peers and will be responsible to research subjects that many people will likely find un-interesting (unless that same student commits to making the subject interesting…). So then, the next question is - can you find a way to be passionately interested (and curious) about what the author is trying to convey, regardless of topic? Given all of the potential benefits, the answer to the question should be a resounding YES. Get into the passages by really trying to connect with the passage and content. By spending more time investing in the passage, and building your RC Ladder, you'll be able to dramatically power through the questions faster AND concurrently boost your accuracy. You must remember that ‘interest’ is a ‘choice’ – it’s generated by curiosity, and you CAN arouse curiosity about ANYTHING at a moment’s notice. Simply engaging a passage with your own curiosity is a revolutionary force with RC (and can play a role in other aspects of the GMAT, including CR, IR and wordy Quant questions). So, now that you see the exciting stakes of being an engaged, curious reader, it's probably obvious that with Reading Comp, you HAVE TO take interest in the passage. So how exactly can you do that? Pretend the clock isn't running - That will prevent you from rushing and having to waste time with unnecessary re-reading (to be fair, some re-reading is required, particularly with Detail questions). Under timed pressure, most people instinctively read a little faster, and that extra speed makes the subject matter feel ‘murky.’ The crazy aspect of all of this is if we were to time the actual difference between when you read the passage with (and without) concern for time, the difference is about 15-30 seconds of total time. That's it! The extra time it takes to read a passage the right way isn't as much as it may seem. On top of that, when you factor in the time saved by avoiding most re-reading later on, you will ultimately save LOTS of time by properly investing in that initial read-through. Be genuinely curious about the topic and the author's perspective - Ask questions, such as: do I agree? Do I disagree? Is that likely to work, or not work? Is this thing any good (or not)? By reading actively, you'll have TOTAL command of the passage, and the questions will be considerably easier to answer. By investing some more time and energy with the prompt, you'll be able to boost your overall pacing and accuracy. Some re-reading is OK. However, NEVER, EVER, EVER wait until you're deep into the passage before you realize you haven't connected with the prompt. If necessary, start over as soon as you can. If you ever feel as though the first sentence is getting away from you, start over. Trying to continue on as though everything is just fine will lead to a total waste of time, a lack of that solid understanding you need, and a lack of confidence when you move to the questions. Nearly all Verbal 99th-percentilers will admit to feeling a bit lost after the first sentence (or two) on certain passages. They then STOP and reread (rather than letting a whole paragraph or passage go by in the foolhardy hope that it'll just somehow magically crystallize). You have to invest in the passages, and you have to do so from the start. Again, you'll more than make up that time with the questions since they'll be easier to deal with. You'll not only be more efficient, but also more effective. • Can you identify each question type within RC (and CR)? You need to be able to. • Do you know EXACTLY what type of information each question type requires of you? You need to. • Can you spot the common wrong answer types in RC and CR? Needless to say, that skill becomes far more valuable in subtle or difficult questions. • DON'T read to retain the details. Read to know the role the details play in the passage (eg. The author just provided 2 examples of the implementation of a certain policy; here, we have a description of an outdated model and reasons why it’s outdated, etc.). I also like to stress that you have to see yourself as training for the GMAT rather than just studying for it. The GMAT is an event that you need to rehearse for, so it's not just about what you know, it's also about the work that you do and how you think. 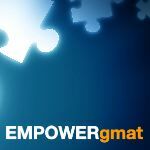 That's why you're going to want to be OBSESSED with your training to be able to apply the EMPOWERgmat tactics during your practice and on the real GMAT. We look forward to helping you crush the GMAT and get you ready to apply to your target schools! Click "Follow" for more GMAT Club Fresh Verbal GMAT questions, and articles.